Hello everybody and welcome to my new blog series: Dredges and Drafting! My name is Andrew and I’ve been playing Magic the Gathering off and on since original Mirrodin. Here, I plan to focus on my favorite formats, Modern and Limited, which we will begin today by cracking open the new set, Shadows over Innistrad! So, let’s get started! One of the first articles I always like reading in the early parts of the format is Ars Arcanum, as he takes a good look under the hood of the set in order to make predictions on the draft format’s speed, crucial CMC’s, and common P/T for creatures. While I have no plans to steal his thunder, I hope to apply a similar mentality to today’s analysis. The first thing I would like to look at is the removal spells of the format. With the shift from set to set, so does the power level of certain styles of removal spells. While cheap interaction, (e.g. 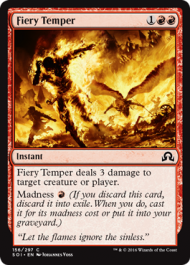 Fiery Impulse, Reave Soul) are great in fast formats, such as Origins or Zendikar, big removal spells (e.g. Grip of Desolation) are much more useful when you actually have time to cast them. 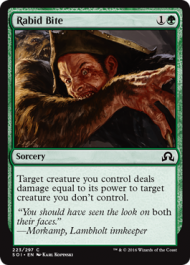 The value of the classic green “fight” card can vary widely from the best green common (Savage Punch) to basically unplayable (Unnatural Aggression). So it’s important to see how each of the removal spells will line up against their potential targets. Here, I loosely define “removal” as anything that has the ability to remove a creature or stop it from doing something a normal creature would like to do (e.g. 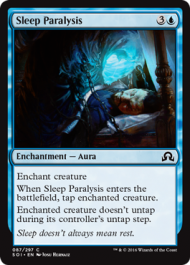 tapped down or “Pacifism” effects). Let’s start by looking at what the new removal spells in the format are. Since this is a first pass of this limited format, I will start by just looking at the common and uncommons. One quick thing to note here is that I lumped the Double-Faced Cards (DFC’s) in with their respective rarities. For those paying attention, you’ll notice those are only uncommons. There are, in fact, only 4 common DFC’s in the set and they are all red and green werewolves with no other abilities (Convicted Killer, Gatstaf Asronists, Hinterland Logger, and Solitary Hunter). Meanwhile, there are 11 different uncommon DFC’s that come in every color and artifacts. WOTC has said there will be a common or uncommon DFC in every pack (in place of a common) and a 1/8 chance of there being a Rare/Mythic in a pack. Since we don’t know the exact distribution of how often we’ll see a common vs an uncommon in the pack, all we can say for now is prepare to see a decent amount of those 4 commons. With that tangent over, let’s look at the removal! Now, this is a quite a bit to look at once, so I find it useful to sort these into different groups of what they do. I will use the following categories for discussion: Unconditional removal, P/T-Dependent Removal, Conditional Removal, Counters, and Sideboard. As I am already making this list, I will also include non-removal cards that could still function as removal, such as Sideboard Cards, Combat Tricks, and Tempo cards. I also try to make a quick note on why the card is in the given category and, if it is a combat trick, how it could commonly be used as removal. 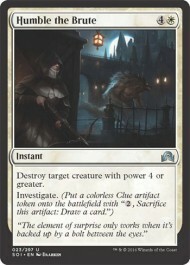 To help study these removal spells, it is necessary to see how they line up with the P/T of the creatures in the set. This can be seen in Fig 1 below, which shows the number of cards at common or uncommon at a given Power and Toughness. To account for how often you will see a given uncommon card, the uncommons are weighted 30% within the totals. For the DFC’s, we only consider the unflipped side, for now. 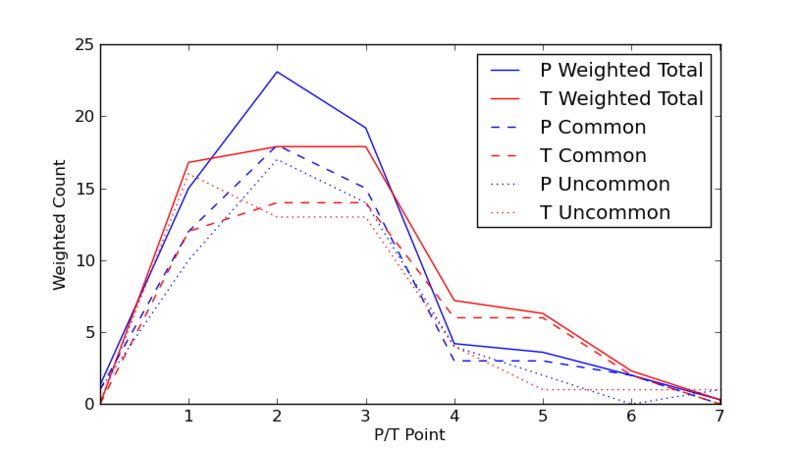 Looking at Figure 1, we can see the power peaks around 2 and has fairly close the same shape for commons and uncommons. For the toughness, the commons have roughly the same number between 1, 2, and 3. For uncommons, 1 is the most common toughness. The total curve’s peak is fairly standard for modern draft sets, which one can see in Ars Arcanum in detail. One curious thing about this is the excessive amount of 4-5 toughness creatures, relative to number of 4-5 power creatures. One could guess that this is made up by the fact that a number of the DFC transform into larger creatures. 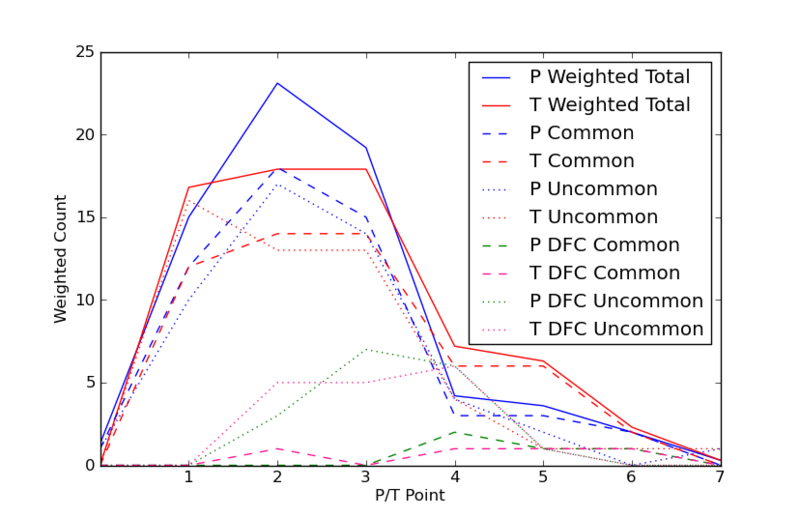 If we plot the P/T distributions of the flipped side of the cards, such as in Fig 2, we can see that there is a fair number of 4 Power and Toughness in both the common and uncommon slot. But, there the 5 disparity still exists. So, as expected, we can see here that Puncturing Light has plenty of good targets, while Humble the Brute has a lot less targets that it would have had in OGW. What is perhaps surprising is the small 1-damage and -1/-1 spells can kill a good quarter of the creatures in the set, many of which are the potentially more powerful uncommons. Furthermore, there are a large number of 1/1 token makers in white, increasing these spell’s strength from the sideboard. Similarly, half of the creatures of the format are killable by Dead Weight and Explosive Apparatus. That said, one could argue that you’d rather your removal be able to take care of the 50% of creatures that you can’t easily kill in combat. 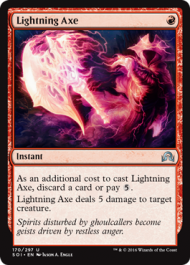 Based on the distribution of 5-toughness creatures vs 5-power creatures, I think that cards like Lightning Axe and Reduce to Ashes may have increased value in this set, while Throttle’s value could be down. This category is a little less straightforward to analyze, given the broad range of card abilities. That said, there are, what appear to be, quite solid common removal spells in white (Puncturing Light), blue (Sleep Paralysis), black (Murderous Compulsion), and green (Rabid Bite). The rest of the good removal is up at uncommon and many cost 4+. For red, unsurprisingly, much of its common removal it is P/T based. As discussed above, the fight-based removal spells may struggle with the 5-toughness creatures, given the lack of 5-power creatures. As a friendly reminder, Gatstaf Arsonists and Solitary Hunter are your common-level green creatures with flipped power >= 5, as well as Kessig Dire Swine. 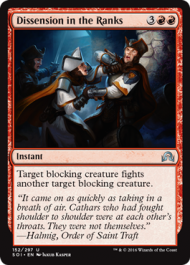 Counter spells are counter spells and sideboard cards are sideboard cards. Nothing too much to say here. 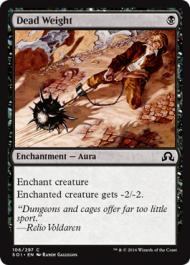 It should be noted here that any sorcery speed or creature ETB effects could technically be a combat trick if the card contains a madness cost. While I didn’t put them formally on the list, it is important to keep in mind if your opponent has any sort of instant speed discard outlet or enough mana to cast 2 spells to flash in a creature or sorcery. 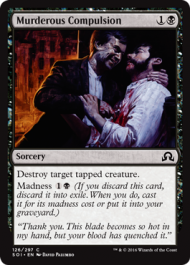 While black and red each only have 1 cheap trick, they could make up for it with their madness “tricks.” In fact, in each color, they all have a decent 1-2 mana cheap trick, with the worst of the bunch being Jace’s Scrutiny in terms of combat usefulness. Also, it is useful to note for the P/T-based removal that only 3 combat tricks pump toughness by 2 or more (Strength in Arms, Aim High, and Might Beyond Reason). 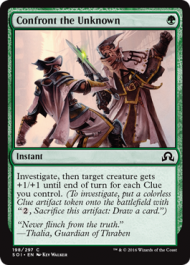 A higher-than-normal repeatable tap is present, although the prevalence will be dependent on how useful Stern Constable is as an enabler (unlikely) and how easy it is to turn on Topplegeist. The numerous bounce effects make the payoff DFC’s more risky. Tapping your cards has become much less important than it did in OGW, as only 3 common/uncommon creatures have tap abilities. Furthermore, there are multiple ways to untap your creatures at instant speed. Well! That’s it for now! 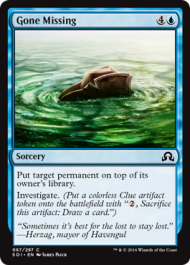 See you next time, where we will delve deeper into the set after we get a chance to actually play with the cards! Enjoy the prerelease! This entry was posted in Articles, Magic The Gathering and tagged Draft, Magic The Gathering, MTG, MTG Draft, Sealed, Shadows Over Innistrad. Bookmark the permalink.